Last night, ten woman and two babies gathered to talk about Reiki and other spiritual issues surrounding Reiki practice and our spiritual journeys. For me, as many Reiki events are, the evening was nothing short of MAGICAL It is so difficult for me to describe these feelings to others who were not there, but I will do my best as a means to inspire others to start their own spiritual round table group or come to ours. (Been to Sequim lately?) Finding a spiritual group you vibrate well with is more important than ever as we are, many of us all at the same time, waking up to a whole new spiritual way of living. Have guidance and fellowship to help you through this is key to progress and having more fun with it. Please read on, especially if you were not at this event. I’m sure each and every person there had a different experience and the same experience all at the same time. I felt a connection, a synchronicity with each person both on an earthly level and a soul level. As they would talk, I would connect with them on the levels of having been through what they had been through, understanding the feelings they were having but also FEELING them myself as well, feeling their soul speak the truth, speak from a higher level of being without even realizing they were. 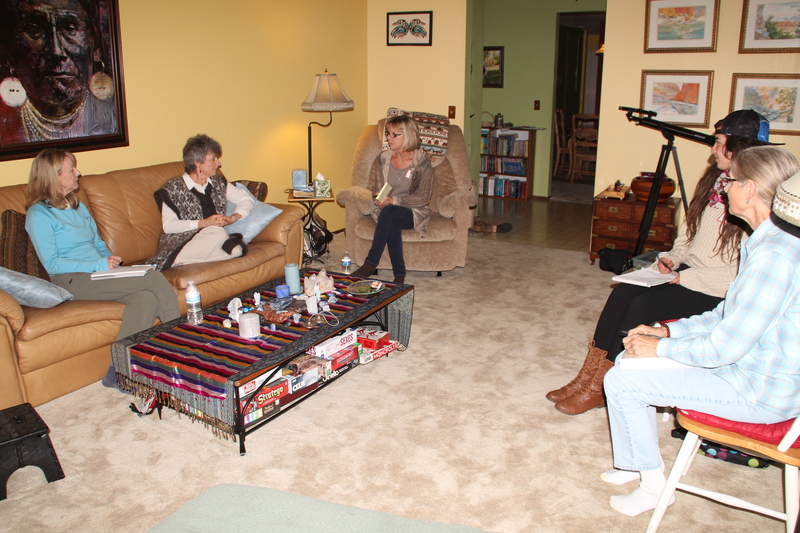 The ladies and babies of our February 2014 Reiki Round Table for Rain Shadow Reiki. Photo by the amazing Chelsea. Please do not reuse this photo without permission. We talked about so many different topics starting with a basic introduction as to what Reiki is to the new guests, then moving onto talking about our souls and our higher self and what it is, downloads of information, vortexes, spirit guides, the difficulty of the healing journey and finding bliss in our lives in the process, plus many other topics I’m sure I’ve absorbed into my psyche but don’t consciously remember at the moment. It was beyond fabulous! We got really deep last night and it was beautiful, confusing and fascinating all at the same time. It was poetic. I can’t share details because everything we say in round table is kept private, but I can share how I felt. I felt a spiritual community coming together. I felt a group of ten women and two babies who mostly didn’t know each other, sharing and baring their souls and feeling healed by it. HEALED BY IT!! I felt elated by the time the evening was over, full of gratitude and literally exploding with Love and Light of our Divine Creator and of these individual souls. I couldn’t go to sleep because I was so filled with gratitude and joy, so I stayed up and wrote love notes to my two boys and snuck them in their bedrooms for them to find when they got up in the morning. Then I settled down and did Reiki on myself. I felt the Reiki working very powerfully, with flashes of light every ten seconds or so like an MRI machine moving over me. My eyes were closed, the light was within. I hadn’t had that experience in about seven years, since a Reiki Master in C.A. worked on me without touching me but created a light show that has not since been surpassed. So there it is. Worth taking two hours of my evening on a school night to be with a group of people just talking? SO WORTH IT!! I can’t wait for the next one! What will Divine bring to us then? I’m already looking forward to it. The next Reiki Round Table is scheduled for Monday, May 19th at 6pm. I pray you can make it, if not in person, then in spirit. Thank you ladies for helping us get this new group started. I look forward to seeing where it goes from here. I feel it’s going to be quite interesting. 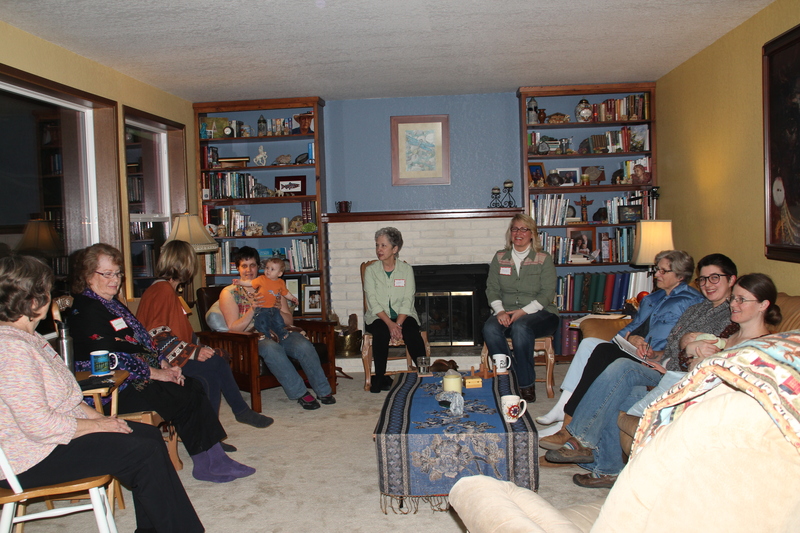 Last night we had our first Reiki Round Table spiritual discussion group here in Sequim, Washington. Six ladies came (men are more than welcome to come too) to discuss everything and anything that came up. We started with a short smudging ceremony, introductions and an opening prayer. Then we sat in the Gassho position to bring in our Reiki to be with us during the discussion. Then for about an hour and a half left we talked and listened. 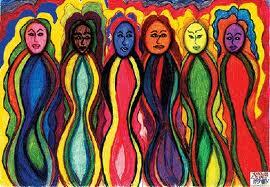 Some of the ladies were my clients and/or students and a few of them were brand new to me and even to Reiki. We talked about what Reiki is and then just let the conversation flow from there. I found it amazing how many different topics we talked about and felt we had covered well enough to each persons’ curiosity in such a short time. I had a blast, but then, talking about Reiki is one of my most favorite hobbies. The topics we discussed were: How to change for good the subconscious thoughts that no longer serve us, healing crisis’ (or as I call them, healing opportunities), other alternative healing techniques such as Myofascial Release, E.F.T., E.M.D.R., Hypnotherapy, Energy Psychology and more. Most of these I have tried and found to help a great deal. We talked about the ways that have worked for each of us to FEEL Divine present in us and around us to help our confidence and faith. We talked about some personal challenges we’ve had and how we have worked with Reiki to help us through them, and so much more I can’t remember it all. I guess I better take notes next time, but I really wanted to just go with the flow. I’ve said it before and I’ll say it again, for your health, for your happiness, for your spiritual growth (which probably should have been first) find a spiritual community to be a part of and GO. Participate, for YOU. Participate for ALL of us. We are all blessed when others heal themselves. We are all blessed when others are happy and sharing Love and Light. We are all blessed when others open up their heart because they have people who care and who listen. We are all blessed when we heal ourselves and others with Reiki. We are ALL BLESSED when we connect on a loving and compassionate level with each other. It is so worth it. That’s it, lecture over. For now. I’m a mom after all, it comes second nature to me. You do not have to have an attunement to Reiki to join us, all are welcome to Rain Shadow Reiki circles and round tables who truly want to learn about energy, Reiki or just be a part of a spiritual discussion group. How else are you going to learn about Reiki? Oh, maybe take a Reiki class!! rainshadowreiki@gmail.com if you’d like to get on my email list for classes, circles, round tables and more. Or call 360-460-7829. I’ve had enough middle schoolers interested in Reiki lately to have a class just for them. Most of them have parents who are students or clients of mine, or both. This works best I have found as the parents and kids can do Reiki together at home and reinforce the practice of Reiki together. These kids are amazing as you could have probably guessed. They know they are different from other kids in many ways but spiritually is definitely one of them. It is not always easy for teens to talk to other kids about spiritual issues. At Reiki circle they get the chance to talk openly about their spiritual beliefs with no one making fun of them or condemning their thoughts and actions. It’s a very open and safe forum for everyone. 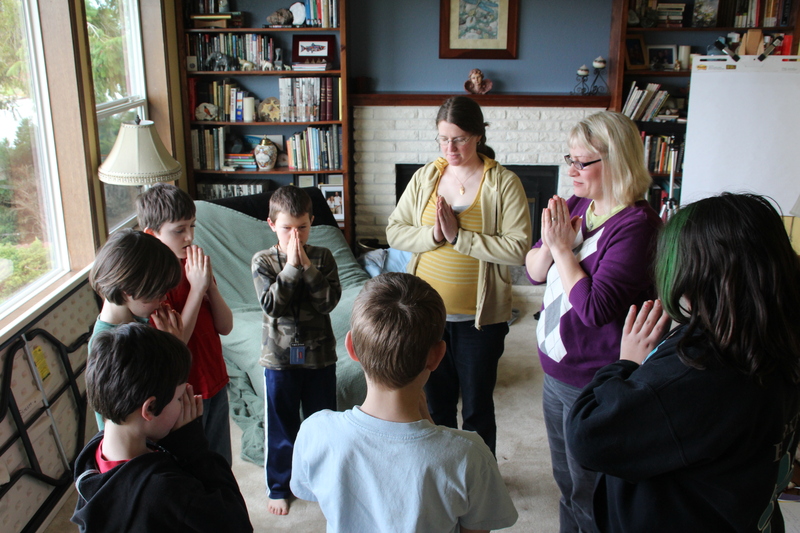 After introductions, we started the class by teaching the kids a blessing ritual to cleanse our auras with sage. Then we moved on to measuring each person’s aura with diving rods. We talked about how to work with spiritual tools in a safe and effective way. They learned how to bring in their God for protection beforehand, how to program the divining rod for what they want to find and then to find it. Each person got a turn with the rods. We measured our auras before the class and again after the class. Every single participant, including the parents, were able to increase their aura size by the end of class, most were able to double their aura size. (We measured the auras the second time right after doing a self-treatment with Reiki.) We talked about how when our auras are cleaner and clearer from doing Reiki, we are happier and healthier on all levels. We also talked about other ways to achieve this such as; listening to beautiful or happy music, thinking positive thoughts, talking with a trusted friend, running Reiki on our food and drink, eating and drinking healthy food and liquids, and getting plenty of exercise out-of-doors, just to name a few. To my surprise, a few of them said that the meditation was their favorite part of class. I guess I thought the Reiki on animals or the diving rods would be their favorite part, but they really liked going into their minds and seeing what they ‘saw’ there. That impressed me. These teens proved to be deep and introspective when they shared what they saw in their meditations. They were also very good at visualizing even with little or no prior experience. Most of them asked to do more long meditations in the future at Reiki circle. 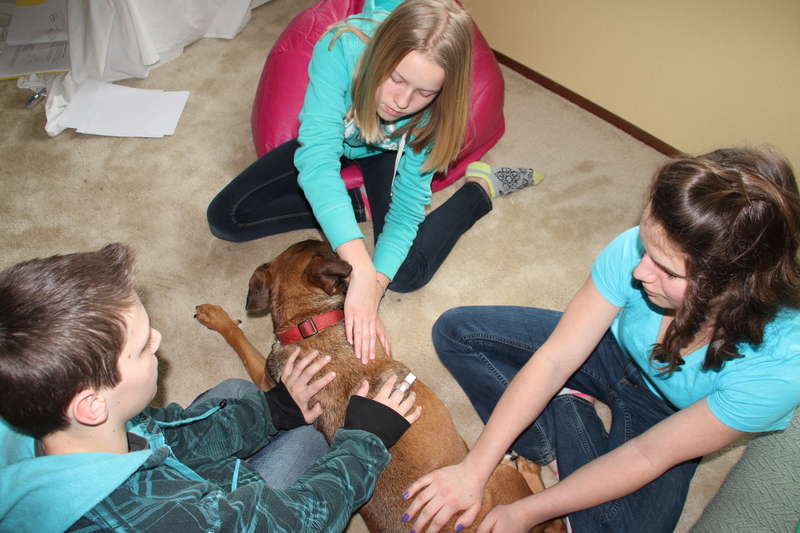 I can tell you for sure, our dog Mandy’s favorite part of class was when all the kids did Reiki on her for practice. Mandy does love to be the pet example for animal Reiki classes. She basks in it and soaks it up. The teens also worked on our cat Cosmo but that was before I remembered to get the camera out and take photos. I have found that after taking a Reiki class, kids tend to do Reiki most on their pets. Unless they are encouraged by their parents, the children are a little more shy about doing Reiki on other people. Even in class this seemed foreign to them, touching others in this new way. This may take more help from their parents. I like to encourage and help them along in it, not force them. Working on pets is a beautiful gift to them and their pets. If that is all they want to do with their Reiki, I’d say that is a whole lot. But, I have also found that if I am truly hurting or in pain in some way and I ask my kids to do Reiki on me, they jump to any chance to be able to help me feel better. If your kids have Reiki in their hands, ask them for help to feel better. What a wonderful gift they are giving you, and what a wonderful gift you are giving them as well. 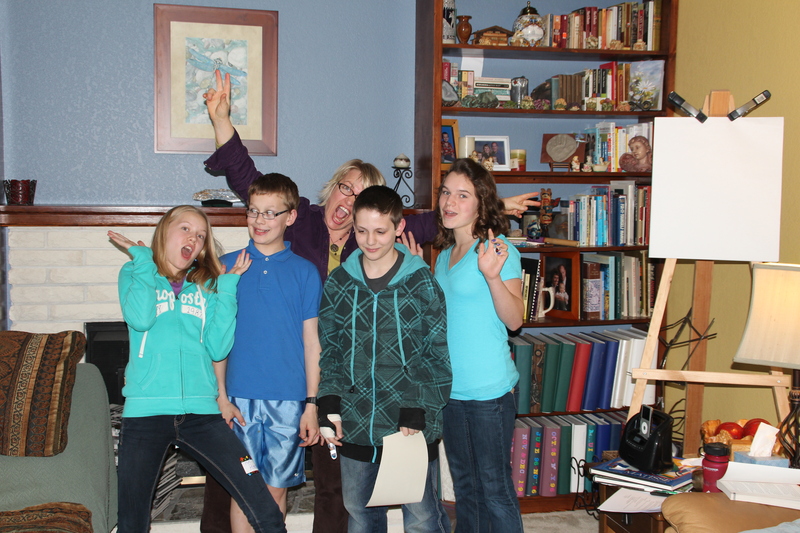 A BIG THANK YOU to all my Reiki kids and their families for supporting them in their Reiki adventure. I’m so grateful for all of you!! On the eve of 12-21-12 I felt the need once again to write a little something. Many are anticipating this big date and what will happen. I do not know for sure any better than anyone else but I have my ideas. What feels right to me. What I do want to tell you is how the energy has been affecting me up until this date. How it seems to be different. As we approach this date I’ve been filled with gratitude daily. I feel in my heart so grateful for everything I have and do. I don’t have to ‘think’ about gratitude or ‘work’ at it, it’s become a huge part of me automatically. All day, every day I’m in this state of gratitude, thanking Divine for all that He does for me and my family, clients and friends. Because of this I have found my mind in a much more positive place. How can you not be, being grateful all day long?! Grounded Rock by “The Rock Fairy” Kim. Another change I’ve noticed has been manifesting spiritually what I need. This has been happening fast and easy as it never has been before. When putting up grounding for a room, myself or another energy system, I used to do a visualization to back up my intention. Now I just think about it and the grounding is there. Fast and easy. Grounding has been one of my big challenges as a healer so this came as a bit of a happy surprise to me. I notice this as well when I’m doing Reiki on myself or clients. Energy is responding much quicker to my thoughts, immediately in fact. Even before I chant the symbol, just thinking about chanting it, it is done. Done before I can get it out of my mouth. I’ve been playing with this and having fun with it to see where it will take me and how it will help me with healings. I don’t know about any of you but I’ve been having some pretty cool and sometimes strange dreams in the last couple of weeks. I had one very vivid and realistic dream two days ago where I was placing my hands on people’s heads to do Reiki healing on them and with just a very short time they were completely physically healed. In the dream I was surprised and shocked by this so I started putting my hands on other people, looking for people to heal to see if it worked on them. It did. I found people with diagnosed diseases from doctors and put my hands on them, they were healed. I woke up, astounded but also with a lot of questions. Like, but if people are healed so easily, where is the lesson? My right brain said “That is not for you to worry about. This is up to Divine.” I believe my guides were giving me a glimpse into the future. I hope so anyway. No way to know until we get there. I know it in my heart, just don’t know the when. Whatever is going to happen in the next week, I believe in possibilities. I believe our human brain cannot grasp the true possibilities of the Universe. I believe they are endless if we open our heart up to them. I’m ready to do that and find out what truly is possible. Are you? The best way I know to do this is through meditation and Reiki. I plan to meditate as often as possible between December 21st and the 25th. I plan to run Reiki in myself and my family to share the Love of Divine in this most spiritual way and time. And I plan to be quiet as often as possible to listen to Divine’s guidance to me. On a recent conference call I had with many other energy workers and Shamanic Practitioners a message came though from a Shaman who is currently working with the Mayans down in Mexico during the transition. She said that between December 21st and the 25th the whole world will be in a time shift. These days are considered to be ‘Days outside of Time.’ We will be in a state of a Shamanic State of Consciousness where we will be in a trance for those five days. We can manifest what we need. Open our hearts to Divine Love and be healed though Divine Source. Like having Reiki for five days straight. (Woo Hoo! That is AWESOME!!) They said the whole planet will be journeying on these days. But, as always, it is up to US what to do with this opportunity. Do we treat these days like any other days and go about our usual business? Or, do we open up to the Divine’s Possibilities and do Reiki, meditate, stay in a mind of openness to all that is Love and Light and open up to the possibilities of this energy coming in? It is as always, OUR CHOICE what we do with this opportunity. Divine gives us ultimate freedom of choice. I know what I will do with it. What will YOU DO? It is time Goddesses to stand up and fight for what we deserve, our own self-love. We have for so many centuries, for so many life times been told that we are not as worthy, not as strong, not as important and not as intelligent as men. It has been so ingrained that we carry with us this belief pattern within our subconscious minds and our energy systems that it is true. It is not true. We know this is not true, yet it is in our belief system. This belief is held in our solar plexus quite often which is our place of spiritual power. This is strongly connected to our heart chakra as well because it has to do with love. But I have been more often finding it in the solar plexus do to the relation to personal power or the feeling of the lack of it. This is a Universal patter that I’m seeing healing after healing lately. Why lately, because universally we have chosen this as the time to let it all go. All of us together. It is a very powerful time to heal. It is time to reclaim our power as souls of Divine Source of all Love and Light and believe in ourselves again. We are needed at this time to feel totally and completely our God Selves and nothing less than. It is time for us to shine bright and to literally FEEL the Goddess within us, not just think it is there. NOT just be told that it is there, but to FEEL it in our cells in our soul. When we FEEL it, we KNOW it within and then we can shine the LOVE out to everyone around us and others will be healed by our love light. There are many ways to heal ourselves to release the old patterns of belief. But, this is a blog about Reiki so for me the obvious answer is to do Reiki on this issue as often as possible right away. Reiki all your chakras starting with the root and going up (really what feels right to you) but put a special intent when working on all of them that the Reiki energy is healing this Universal belief system of worthiness and self-love. As each one of us heals this issue it creates a ripple effect and makes it easier and easier for others to do the same. I also carry around beautiful yellow stones to help me heal this issue. I have been wearing an orange calcite on a very long chain for about six months. I hands just above my solar Plexus. I take it off at night while I sleep to cleanse it and put it back on after my shower in the morning. Choose a yellow stone that speaks to you and wear it proudly. Don’t forget to thank the rock for aiding you in your healing goal. When I do a healing on a client, afterwards I stand in my Gassho (closing ritual) thanking Divine for the healing and I hold the intent that the client and I are both healed by this session. Then I hold the intent that the whole world is healed by this session. At that time, I can SEE though my third eye, just by putting my attention on it, the grid that surrounds the earth that every single human and animal is connected to. With each healing I do, I see how lights on the grid are lit up. I can SEE how each and every healing that someone does effects everyone else. THAT is how I know in my heart that all will be well with the world. Love is always strongest. Light is always strongest. All will be well with the world! I was recently asked to be a part of a spiritual group that meets from time to time via conference call and once a year at an agreed upon location on the west coast usually. It is a big commitment but also I felt it was a huge honor to be asked. This group includes people of many different spiritual belief systems from all over the country. Because I’m a mom first at this stage in my life by choice, I asked my family if they were willing to support me in the time it would take away from them, extra to the Reiki time that I spend with clients and circles. They are very supportive of my passion for energy healing and helping others and know how much it means to me to be a part of this group of honored people which includes Shaman’s, energy workers, other Reiki Masters and more spiritually like-minded people. I’ve been with the group a month now and have participated in four conference calls so far. On the conference call I attended yesterday, June 6th 2012 for the astrological events happening with Venus, we all meditated together on the phone with the intention of a group healing for us as well as a healing for our earth. Kid’s Reiki Circle, before practicing Reiki we do our “Gassho” which is asking Divine Source to be with us and to send down the Reiki energy. The energy in my Reiki room is great all the time because I focus on it a lot with the intention of healing energy and high vibrational Love and Light energy. But with the group of spiritually minded people on the phone all with the same purpose, I felt the energy stronger than I had in a long time. Probably since another group meditation that I had done with a very large group of people many years ago. I felt the energy of each person in the room with me. The energy gets amped up the more people we have all with the same intention. It was decidedly powerful. I got a clear message from Divine Source while in that meditative state. Divine wants us to meet in collections of spiritual people and do this spiritual work together. Divine wants us to meditate, do Reiki, pray, learn, cry and support each other as often as possible in groups. This is the way to change our world, this is the way to raise our vibrations faster, sooner. This is how to truly make a difference in our lives, the earth and everyone around us, by connecting in groups of like-minded individuals consistently. This is why I offer the Reiki circles twice a month and to children too, because I truly believe and have for a long while that the true way to make a difference in our world of reality is to work together in small, local grassroots types of organizations like our own little Reiki group here in Sequim, WA. Find a colorful group that you feel comfortable in that has the same values and spiritual beliefs, then participate actively in your own evolution. If you do not live on the Olympic Peninsula, then find a group in your area to join. Put the intention out to Divine Source that you want such a group. Look for a Reiki Master in your area and ask if they run such a group. Meanwhile, find an on-line group to be a part of. Join a Reiki Facebook page (Josslyn Streett, Reiki) or other social networking site that consistently has a positive high vibrational and up lifting message and be a part of it. Put yourself out there, try something new even if you are a little scared. I believe you will find that your evolution goes faster, but will also be more rich and fulfilling along the way with spiritual friends along for the ride. I often find other blogs or articles that say for me what I want to say but can’t seem to put into words. I found this wonderful, easy to read and well written article about WHY to join a spiritual group, what to look for in a gathering and some tips on starting one of your own if spirit encourages you to do so. Well worth the time to read it. Enjoy! And, I hope to see many of you at Reiki circle! 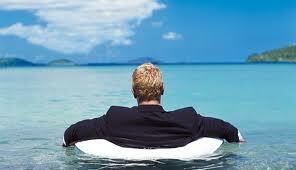 The truism that no person is an island applies in the spiritual arena even more than it does in the material. From the most ancient times, people have gathered in groups and communities to engage in spiritual practices addressing the Source of life, the Ineffable hidden beyond our senses. Monasteries and other spiritual communities bring seekers together to live in a protected and conducive environment. In lay or non-monastic environments, the work of the congregation, the sangha, the minyan, and the halka offer spiritual brotherhood and sisterhood within the context of life in the greater community. Why has this always been the case? Primarily because the spiritual community or group multiplies, empowers, and reinforces the efforts of the individual. Meditation, prayer and other practices, when pursued in a group or community, qualitatively and quantitatively magnify what each person can offer and experience. The coalescence of the group into a shared will and shared consciousness in communal practice creates a greater spiritual whole that enhances individual possibilities. The vehicle of the spiritual group or community carries all its individual participants to far greater spiritual depths than they could typically reach on their own. The group serves as a container for energies and as a reminder of the sacred. Each person in the group or community helps all the others by their very presence and by their orientation toward the Divine, toward love. In business and other life endeavors, people form alliances and partnerships to create much more than they possibly could by themselves. In the spiritual endeavor, the same holds. We can join forces, share our hearts’ search for the spirit, and help each other climb the mountain of transformation. Nevertheless, spiritual groups and communities often succumb to pitfalls. Some principles to consider in the work of a spiritual group or community include the following. In the most basic sense, we are all beggars and beginners in the spiritual path. In the face of Divinity, we are all equal, equally children of the Will of the World. This bedrock principle must pervade the work of any spiritual group. Elders, teachers and those with more experience of the path, if their inner work has been rightly conducted, will, through their genuine humility and respect for others, exhibit an implicit assumption of equality in all their relationships, including with people in the spiritual group or community. We all serve the same Source. For a group to function well, the members must agree on the path and methods to be studied and followed. Without some commonality of technique and direction, the group will (or should) be short-lived. The question of leadership in a spiritual group raises complex and difficult issues. If there is to be a leader, it must be someone with consistently deeper experience in the path than the rest of the group; otherwise the leaderless peer group offers a more appropriate form. Kindness and non-attachment form two more qualities required in a group leader. Without these, history teaches us that spiritual leaders tend to grow abusive, emotionally, sexually, and financially, or they demand loyalty to themselves and their particular path rather than loyalty to the Divine and to the great community of all life. The leader must inspire trust in his or her goodwill, and confidence in his or her wisdom and knowledge of the path. Condescension, a patronizing attitude, an air of being special, abuse of power, arrogance, and insults do not characterize an effective spiritual leader, regardless of the pious justifications and excuses offered for such behavior. The essence of the role of the spiritual mentor is to share his or her passion for the path and to instill confidence in the possibility of realization. More subtly, we can look at the leader’s role in terms of the three aspects of will: active, passive, and reconciling or synergistic. The great temptation of a spiritual leader is to play an active role, with the students being passive or receptive to the leader’s lead. This causes many, hard-to-recognize problems. It feeds the leader’s ego, as do the group members by fawning over him or her. Then the group builds an ego around the leader, instead of fostering humility. It robs initiative from the group members, for whom initiative in their own inner work is crucial. The group members become dependent upon the leader’s judgments of them, on the leader’s criticism or praise. This stifles real progress. A truly effective group fosters freedom and individuality in the group members, an individuality that forms the basis of service and surrender to the Divine. The alternative to the active leader is the reconciling or synergistic leader, neither active nor passive, but both and more. Such a leader, in his or her being and in his or her teaching, points the way toward the Sacred, while leaving room for the group members to be active and work from their own initiative. The qualities of humility, lightness of touch, and non-judging, as well as a deep understanding of the spiritual path and a living, thriving connection to the Sacred characterize the ideal leader. The leaderless peer group can operate by consensus. If the group spends time speaking about experiences and efforts in the path, then what each person shares must be treated with respect. If the members of the group analyze, criticize, offer advice, or make suggestions in response to another member, they risk poisoning the atmosphere of the group. For honesty and sincerity to prevail, an environment of trust and respect must be developed and protected. Peer group members should limit what they share to relating their own experiences and efforts, and not stray into playing the spiritual mentor. No one can do the spiritual work of another. Guidance, to be effective, must be asked for, not offered gratuitously. In a peer group, guidance can come from hearing the efforts, successes, and failures of the other members of the group. Both forms, the peer group and the led group, have their place and can greatly accelerate the inner work of the members of the group. In the earlier stages of the path, having a leader offers important benefits. In the first years, we need to be taught the methods by someone who understands them. We need to be nudged back onto the path when we stray. We need to recognize the limits of our own understanding and be willing to ask for and receive guidance. This promotes humility and insulates us from that bane of spiritual work: arrogance. We also need confirmation of our understanding, so our confidence and self-reliance can grow. However, a led group requires a leader with the characteristics described above. Lacking such a person, the peer group can be an excellent alternative. Living in a genuine spiritual community that works and practices together confers the blessings of a powerful, traditional way toward the spirit. Few of us, though, exhibit a willingness to become monks or nuns. Furthermore, living full-time in a spiritual community does not constitute the best approach for everyone. It depends on one’s temperament and style. Retreats convey the advantages of life in a spiritual community on a temporary basis. Periodic retreats, in which we focus entirely on the work of presence, deepening awareness, and opening our heart, can prove enormously beneficial in reinvigorating our inner work. In our normal life situation, a weekly group meeting, attended regularly, offers an external reminder, a source of energy, and a shared commitment, enabling us to maintain our practice in the face of life’s many distractions and pressures. In certain respects, this creates the ideal circumstance. We need great determination to continuously return to our practice in the midst of family, job, community, and other responsibilities. Life becomes our training ground. If our spiritual practice can flower within the challenge of normal life, our practice will grow strong indeed, our hearts open, and our lives transformed. Practice in the special environment of a retreat or a spiritual community can usher us into deep experiences, tastes of the true spirit. Yet when we return to our normal life, those experiences gradually fade, while thankfully leaving a residue of purification and commitment. Practice in everyday life, however, can bring lasting transformation. Daily progress may not be as dramatic and rapid as during a retreat, but can be more permanent. Gradually, the path and our life merge, so that our life is our path, carrying us toward the opening of our hearts and the Great Source of All. 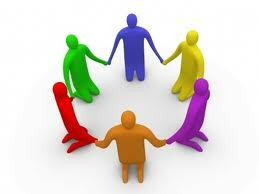 The spiritual group, to be effective, devotes time to both shared practice and shared discussion. A group which does not meditate, pray, or engage in some other collective spiritual practice misses the remarkable opportunity. Discussion alone, even of the most profound, heartfelt and weighty topics, rarely touches our soul. Discussion alone does not serve the transformation of energies and the purification of will in the way that shared practice can. Group practice alone, however, may not illumine certain valuable details of the path. For this, the group needs shared discussion. The discussion, though, must not be solely theoretical: it should focus on the details of practice, how one actually practices, what obstacles one encounters, what helps, what experiments one tries, what new insights come, and so forth. If each person in the group describes such living details of their own spiritual efforts, every person in the group benefits thereby. Everyone can relate what the speaker articulates to their own life and path. A theoretical discussion of ideas rarely has such an impact. Like every individual, each spiritual group or community is unique, and will have its own style, its own lifecycle. But all genuinely spiritual groups and communities support the transformation of their members and enable them to serve in a deeper way than would be possible on their own. If we are fortunate enough to participate in a spiritual group that suits our needs and our taste, well and good. If not, perhaps we can find one other person to share our practice with, forming a group of two. Otherwise, we do our best to pursue our spiritual practice on our own: for this also is possible and necessary. No one else can free us; no one else can do our inner work for us. But we can help each other. Another Great Reiki Circle – It’s All Good! I’d like to thank all the amazing women who came to Reiki circle this month, April 2012 and one amazing Reiki husband, mine!! You all have such loving and heartfelt energy, you make my “job” a total pleasure. 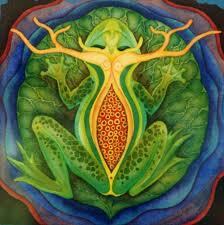 Ladies, this Transformational Goddess Mandala is for you, artfully painted by Raina Colvin . Raina has amazing mandala's on her website. Beautiful work. 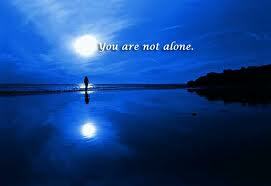 We also had two guests come this month who plan on taking Reiki I at the end of the month. They wanted to get in on the energy as soon as they could. I honor your desire to want to start right away and also get a sneak peek at what you will soon be doing. I can’t wait to hear your thoughts about Reiki energy before AND after the class. Please feel free to comment directly on this blog so others can learn from your experience. It is an excellent idea to receive Reiki treatments before your first class. It is not required of course, but highly recommended. I believe it makes the transition into energy smoother and even more spiritual for each individual person. Mentally, you get an idea of what is coming, how one gives and receives Reiki and some of the process we go through in order to channel the Reiki energy. When you learn this in the class, it is no longer completely and totally new to you. It has familiarity, thus, you may take it in easier. The Reiki treatment before an attunement also helps to prepare your chakras and spiritual bodies for the attunement process. In some cases this can help people accept the channeling of the Reiki energy for the first time much easier. It may help to release blockages that you didn’t even know were there. However, I feel each persons path is unique and many do not need or desire to have a private session or go to a circle before their first attunement and for them, that is the perfect path. Whatever we do in our Reiki journey is perfect for us. It’s all good. That’s what I love about it. It’s literally, ALL GOOD! Ellen O., Pat, Mandy, and Joss work on Ellen R. while Robert takes the photo. The energy of the group ramps up the energy in the room and the healing that takes place is amazing every time. What I also truly love about Reiki is the excitement I felt in the beginning when I was first learning, it has only grown, not diminished like many things do. It gets more and more amazing to me the more I learn. How many careers can you say that about? Plenty I’m sure, but not any others that I have had. PLEASE comment if your career is more exciting to you now than it was when you started over six years or more ago!!! And do tell us what that career is. Thank you all for participating in this energy blog, the circle and our universe! Love and Light to you all! This is the first post of a series I’ll be doing over time of book reviews of the books I’m reading. If they sound interesting to you and you are local, all books are available in my lending library. A donation is appreciated. 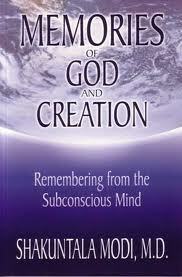 The book I am reviewing is, “Memories of God and Creation” by Dr. Shakuntala Modi. This is the second book of Dr. Modi’s that I have read and throughly enjoyed. In fact, I have not read a book on this particular topic before using hypnotized subjects. I found it incredibly interesting. Plus, it made me think a lot about my own beliefs and what makes sense to me. Loved that! 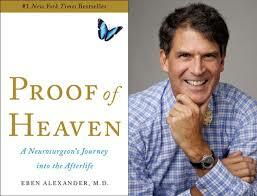 Any book that opens my belief box to such a large extent receives a great rating just for serving me in that way. Dr. Modi is a Psychiatrist who found that most of her patients were not actually getting better. She searched for another way and found great healing through hypnosis. She now combines the two modalities and has amazing success. Due to my background in hypnosis, I find myself continually drawn to books by hypnotherapists. I find it a bit easier to believe the information when it comes from many different hypnotized patients, yet they all get the same message. At the least, it is very intriguing. With anything you read, watch on T.V. or hear over the radio, I recommend you read this and all information with your own personal filter on. Do not take in any information without you reviewing it personally first and seeing how it FEELS to YOU. Your intuition is what counts for you. Most of the information in this book felt right to me and so I took it in and have been able to use much of it to enhance the healings that I do. However, there were a few things that I feel were not of the Light completely and maybe got slipped in when the author was having a difficult day and she choose to put in information that maybe was not from her highest source of guidance. Because this happens with all written material, be aware, read with your filter on and take in only what FEELS right to YOU! 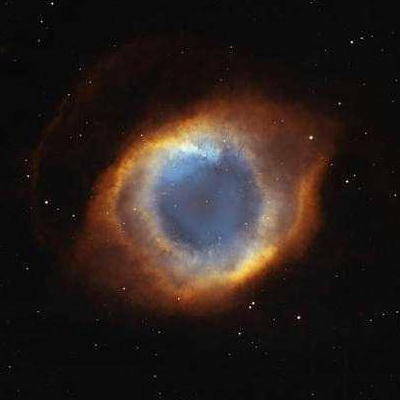 "EYE OF GOD" Netlore Archive: NASA photo of the Helix Nebula taken by the Hubble Space Telescope has been labeled the 'Eye of God' by frequent forwards. What I found most interesting is the detailed descriptions from all the patients of How the God energy started, grew and then created life. I found it very possible due to how much creation of Divine Source mirrors creation on Earth, such as cells dividing. I won’t give it away but only say that if you are ready, truly ready to expand your “box” on this subject. This book is very worth reading. The patients also describe similarly in detail how Lucifer and his followers grew and then left God to be their own rebellion, their own revolution against the Light. I also enjoyed reading her take on how the creation of individual souls happened and how each soul continues to be connected to God but with all the issues and emotions that came with the “disconnection” from God. As a healer I read everything with different glasses on than others. I look for ways and ideas of how to use this information to help in the healings that I do. I have to say, THIS book gave me more information and more ideas on how to help my clients than any book I’ve read yet. This book with all this visual information about our Source helped me to create a system of “Source Healing” for healing very deep issues like: abandonment, self-worth, anger, vengeance, disconnection from Divine Source, feelings of isolation, depression, abuse, judgement, not fitting in anywhere, and so much more. It is my belief that much of the deep emotions that people are feeling coming to the surface at this time are very core issues directly from our separation from God that we have never been able to work on before at this level. I feel we are at a place in time and energy within our planet that these issues are able to be healed, ready to be healed, at the very core levels. We only need to listen to our inner voices and not ignore what we are feeling. This book helped me to see that and helped me to create a healing system to work at these deep levels with the energy therapies that I do. Wondrous! If I had stars to give out I’d give this book 4 1/2 out of 5 stars. Read, read, read and Enjoy!